Evan has always thought he was put on this earth to be in public safety and help others. However, when his weight began causing a variety of health issues and limiting the amount of help he could offer, he knew it was time to make a big change. At his initial consultation, the Weight Loss Solutions’ team approach eased much of his apprehension and worry with its straightforward and upfront approach to losing weight and getting healthy. Plus, his mom had undergone bariatric surgery years before, so he had witnessed its positive impact firsthand. For all these reasons, he decided to take the leap. Evan had his weight-loss surgery in May 2015 and has lost an amazing 240 pounds — that’s two people! Throughout his weight-loss journey, he relied on his free Fitness Plus gym membership and the many support tools and program goals that Weight Loss Solutions had to offer him. Today, his job as a volunteer firefighter and EMT has gotten considerably easier, he no longer is taking medications for a variety of health issues, his sleep apnea has disappeared and he recently began his police officer training in a local police academy program! Weight Loss Solutions has truly had a transformative effect on Evan’s life. He is now very active, loves being outside and involved in sports and riding his motorcycle. 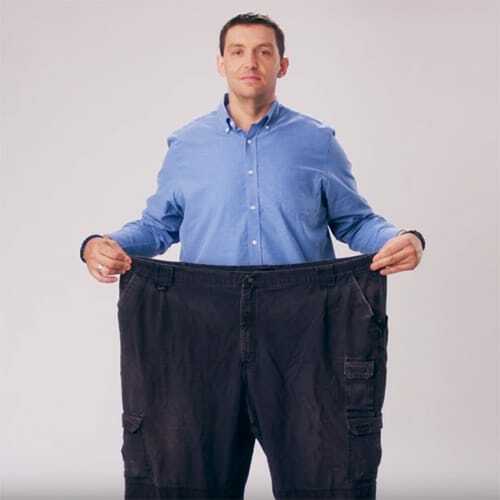 Besides his old clothes, he has completely thrown away his unhealthy, “homebody” lifestyle and sees this Weight Loss Solutions’ experience as a rebirth – giving him health and happiness, more confidence and a new lease on life. To learn more about Weight Loss Solutions or to sign up for one of our free monthly weight-loss seminars, call 573-331-3996.